Cake 1: Pound cakes - Do You Know The Muffin Man? I had forgotten how early 8:30 am is. This class is taking place in a different, smaller lab than the one I was in before. The makeup of the students is about the same, largely female; with a full class and a smaller room, it will be pretty hectic when we make labour-intensive products. Our instructor's past experience includes production manager at Dufflet, pastry chef at Langdon Hall and various teaching stints at the College. I think she said her current work is at Baker Street Bakery. Chef is very personable and I expect to enjoy this session. We replaced half the butter with shortening, which incorporates more air when it is creamed. Butter's milk solids also tend to draw moisture, so the cake will dry out. We used half bread and half cake flour to provide both structure and tenderness. We added some baking powder, as a foolproof cheat to ensure the cake would rise. We added salt, clear vanilla extract and lemon emulsion to balance the flavour. The loaf pans were thoroughly greased and floured and we scraped the batter into them. At this point, our instructor let us in on a secret employed in most supermarket bakeries: the crack that usually forms on top during baking is often introduced before it goes into the oven. By taking the edge of a scraper and dipping it in oil, then lightly creating an indentation in the top of the batter, you create a crack that will widen as the cake bakes. Next, we made a high-ratio pound cake, the kind usually found in a cake mix. 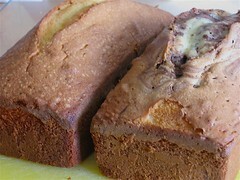 It has a tighter, finer crumb than the traditional pound cake, and has an increased shelf life. 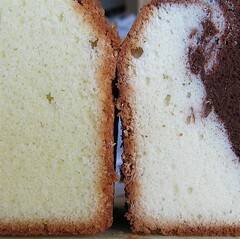 You can see in the second photo the slight difference in the texture and crumb of the two cakes. On the left is the traditional pound cake; on the right, the high-ratio cake. The recipe we used didn't quite fit the descriptions in these two references: we used equal weights of flour and sugar, about half the weight in shortening, and the eggs and liquid made up slightly more than the weight of the flour. This cake employed the two-stage mixing process, as opposed to the standard creaming process we used in the traditional pound cake. First, we mixed the flour, baking powder, sugar, salt, milk powder, flavourings, emulsified shortening and water on medium for 7 minutes. Then, we added the eggs and egg yolks in stages, scraping all the while. Chef let us make a marble variation by holding back some of the batter and mixing it with cocoa powder. After spooning it in the centre of the rest of the batter, she took the handle of a wooden spoon, and gently swirled the batter in a corkscrew motion making sure not to touch the sides. When they came out of the oven, we depanned them and let them cool on the counter. Unfortunately, I have to miss the next class as I'm attending a workshop. Too bad, because we're making a layered carrot cake with cream cheese frosting and marzipan carrots.